Rejuvenate your skin inside and out! on iVillage.com and start looking younger today. Take a FREE IQ Test from iVillage.com and find out now! Beauty Newsletter: Get the inside scoop on trends, offers, and product launches. 1. Bumpy Skin - with summer, comes more heat, humidity and perspiration. This can easily lead to clogged pores and is common on all skin types - even dry skin. Even though summer lends itself to being a care-free time, it's still important to follow a skincare routine that includes regular, mild exfoliation of surface skin cells. Applying an AHA product nightly and using a mild exfoliating cleanser 1-2x weekly will help reduce the bumps. 2. Acne - in addition to face bumps, acne breakouts on the back and shoulders are more prevalent. Always shower after exercise or being in the humid environment and remove wet or soiled clothing immediately. Bacteria increases inflammation and irritation, therefore an anti-acne / anti-bacterial cleanser is ideal for use in the shower. Also a back spray / treatment can be used daily in the summer. 3. Pigmentation - more sun exposure equals more pigmentation concerns. Hyper (or excess) pigmentation appears as brown spots and blotchiness. It can be controlled with regular use of daily vitamin c treatments and hydroquinone based treatments, however wearing a spf of at least 15 daily is a must. On lighter skin pigmentation can appear red in areas that an acne blemish has healed, on darker skin the pigmentation area from a blemish can appear burgundy or purple. Tanning blemished skin is a don't, for even when the spot heals, there can be a discolored mark, often referred to as post- inflammatory-pigmentation or polka-dot syndrome. 4. Ingrown Hairs - Waxing of the bikini line, legs and underarms becomes more common in the summer time, and can lead to ingrown hair and inflamed bumps if not done correctly. To prevent ingrown hair, every evening apply and exfoliating body lotion with AHA, and use a gentle body exfoliant in the shower. 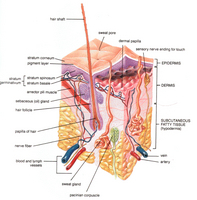 This keeps excess skin cells from covering the follicle (pore) opening, which contributes to the ingrown hair. 5. Oily / Dry / Dull skin - Summer is the time to re-evaluate your skincare regimen. If you are oily, you probably get oiler in the summer. Make subtle adjustments such as switching your moisturizer to a more mattifying one and adding a clay based mask to your weekly routine. Dry skin routines can be "lightened up" by using gel formulas OR dual-purpose moisturizer / SPF in one. Breakouts for all skin types are common, so adding an acne spot treatment it vital. 6. Keratosis Pilaris- These are little dry bumps that appear on the back of the arms and on the thighs. They can occur year round, but usually are not a focus under winter clothing. Common on all skin types, even in children, these are basically caused by a build-up of skin cells that block the hair follicle. Keeping these areas exfoliated with a Salicylic Acid or AHA based lotion works. 7. Redness/ Inflammation - Heat can cause red / rashy sensitive skin. Use products that reduce inflammation and get an added boost of SPF by taking a pomegranate supplement along with the topical use of sunscreen. 8. Spider Veins - are more prominent in "short-short" weather. Before summer starts, get veins treated by a Dermatologist with laser or scolerotherapy and use a self-tanner to warm up the skin tone, camouflaging veins. Dr. Howard Murad, is one of America's foremost authorities on internal and external skin care. Now, Dr. Murad shares his "inclusive" skin care approach to anti-aging in THE MURAD METHOD: Wrinkle-Proof, Repair and Renew Your Skin with the Scientifically Proven Program (St. Martin's Press; $24.95). Based on his belief that healthy skin is a reflection of total wellness, both inside and out, the book outlines an innovative skin care plan that repairs and rejuvenates the skin, while slowing - even reversing - the damage that causes aging. By following a five-minute regimen, twice a day, individuals will see measurable benefits in just five weeks time. Beauty, Fashion and Style Community! Do you have skin care questions, and need more answers? Ask for advice, in our NEW online community! Post your beauty, fashion and style questions... discuss trends, share your tips, ideas, post product reviews, raves and so much more! *We archived our old message boards, within the new community, so you can still read them! For maximum sun protection, wear a hat with a brim at least 4 inches wide. You should apply your sunscreen at least 20 minutes before going into the sun. That gives the active ingredients time to soak into your skin. Stay out of the sun when its rays are their strongest: between 10 a.m. and 4 p.m.